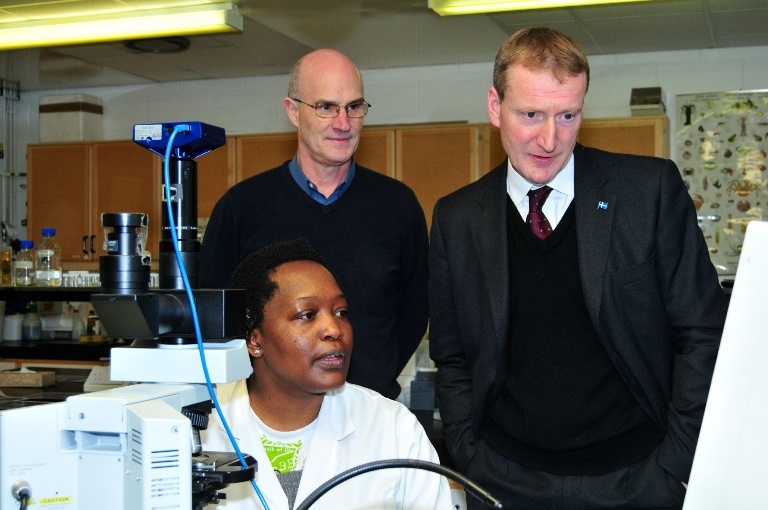 Tavish Scott MSP discussing research with staff of the University of Stirling’s Institute of Aquaculture. MSP for Shetland, Mr Tavish Scott, made a special visit to the University of Stirling recently to find out about the research work being carried out at the Institute of Aquaculture and the School of Sport. Mr Scott – who is the current Scottish Liberal Democrat Spokesman for Transport, Rural Affairs, Fisheries, Environment and Sport – met with academic staff and research students from both divisions of the University, to hear about current aquaculture and sport projects and to discuss how the research may benefit Scotland and communities across the globe. Mr Scott’s tour began in the University’s world-class Institute of Aquaculture where the Institute’s Director, Professor Brian Austin, showed him around the facilities. This involved a visit to various laboratories and the tropical aquarium and included talks on parasitology, sea lice control, sustainable aquaculture and nutrition. The final stop on the Aquaculture tour was the Institute’s special Omega 3 testing facility where Mr Scott had his Omega 3 levels measured. The Aquaculture tour enabled Mr Scott to find out about various world-leading Stirling projects which all seek to develop solutions or meet challenges relating to economics, health and the environment. Tavish Scott MSP then visited the University’s new High Performance Sports Science and Sports Medicine Facility where he was given a tour by Leigh Robinson, Professor of Sport Management and Kevin Tipton, Professor of Sport, Health and Exercise Science. They discussed the details of current research projects in the fields of performance and biomechanics and how such research is facilitated by the new state-of-the-art facility. They also discussed how the £1.1 million facility benefits a wide range of users, including University Health and Exercise Science researchers, students on the University’s International Sports Scholarship Programme, athletes in the sportscotland institute of sport network, as well as members of the local community. During his visit, Mr Scott commended both the Sport and Aquaculture teams on their work and spoke of his support for the organisation’s key role in working closely with industries and communities to address priority areas through research. He said: “I learned a great deal about the new initiatives being undertaken at Stirling. There is much pioneering work which can have important commercial potential to the benefit of the aquaculture industry.